Stanislav Ianevski, the Bulgarian actor who played Quidditch superstar and Durmstrang student Viktor Krum in both Harry Potter and the Goblet of Fire and Harry Potter and the Deathly Hallows: Part 1, recently spoke to Entertainment Weekly about his roles in the ‘Potter’ films. Interestingly, Ianevski spoke of a “love triangle plot”, conceived by director David Yates, and not present in the Deathly Hallows book. And how would the love triangle have ended? Victory for Bulgaria? The actor jokes, “Viktor would obviously win and then live happily on forever with Hermione”. You can listen to Ianevski’s interview through EW’s Binge podcast, which also includes an interview with ‘Potter’ costume designer Jany Temime, by clicking here. Earlier this month, we reported that the Harry Potter soundtracks would be released on vinyl for the first time, beginning with the score for Deathly Hallows: Part 1. Now, a vinyl release for Deathly Hallows: Part 2 has been announced. The score will be available as a double LP on special black and blue marbled vinyl, with a pressing limited to 1000 copies. The score will be released on September 28 of this year, a month after the Deathly Hallows: Part 1 release. 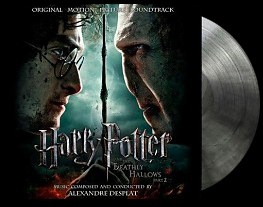 Alexandre Desplat scored both Deathly Hallows: Parts 1 and 2; you can learn more about his scores and the six earlier releases in our soundtracks and sheet music section. The folks over at New On Vinyl let us know that for the first time, the Harry Potter soundtracks will be released on vinyl. 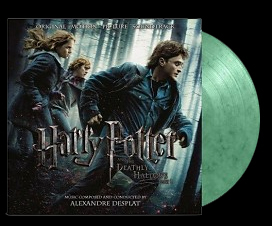 Alexandre Desplat’s 2010 score for Harry Potter and the Deathly Hallows: Part 1 is the first to be released, and will be available as a double LP, on green marbled vinyl, with a limited print run of 1000 copies. Alexandre Desplat scored the seventh and eighth Harry Potter films, taking over from John Williams (Philosopher’s Stone, Chamber of Secrets, Prisoner of Azkaban), Patrick Doyle (Goblet of Fire) and Nicholas Hooper (Order of the Phoenix, Half-Blood Prince). You can preorder the Harry Potter and the Deathly Hallows: Part 1 vinyl by clicking here. It will be available for shipping on 31 August. Learn more about the Harry Potter scores over at our soundtracks and sheet music section. From the ‘Deathly Hallows: Part 2’ DVD/Blu-ray, available on December 2nd.